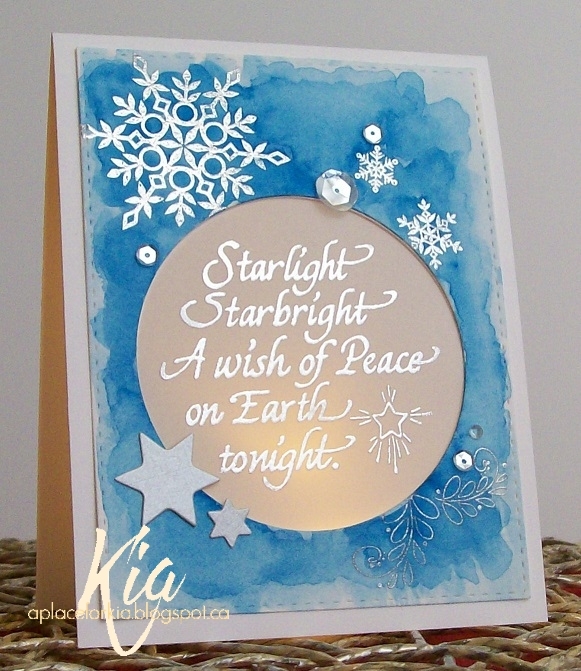 Introducing Starlight Starbright and another tea light card. I love this card ...and am so tempted to keep it for myself! But I will send it off to the person I made it for, along with a battery operated tea light. 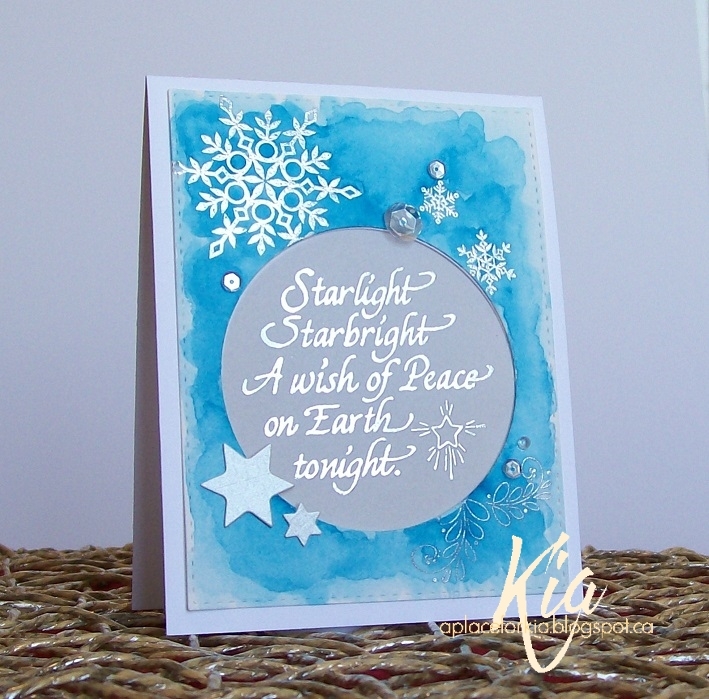 I heat embossed the snowflakes and flourish using silver embossing powder. I cut the circle with my spellbinder die, and cut the panel using my stitched rectangles. I then did a very light blue wash, then added turquoise and just turned the card as it was drying. I added the metallic stars that were left over from another card. I then stamped the sentiment on 40lb vellum paper and attached that to the back of my card. To keep it nice and neat, I die cut another panel for the inside to cover the tape I used to hold the vellum. And finally, a few sequins ... so pretty. Thank you for visiting today. This is the card with the tea light on inside, even better when it is darker. Products: Simon Says Stamp Holiday Envelope Sentiments, Flourish from Penny Black Christmas Cheer, Stampendous Starlight Peace Sentiment, Spellbinders Small Nested Circles, Neenah Cardstock, Fabriano Hot Press 140lb Watercolour Paper, Winsor Newton Watercolours, 40lb Vellum, Silver Embossing Powder, Silver Metallic Stars, Sequins.